Eltronicschool. - This is one of the simple circuit schematic of television transmitter based on transistor. This circuit will give you the UK standard 1 FM for audio modulation and PAL for video modulation. In here beside we will give you circuit schematic of TV transmitter using transistor, we also will give you the global description about this circuit of TV transmitter using transistor from original source. Circuit schematic like in Figure 1 above is simple TV transmitter using transistor. Accordingly Circuitstoday site describe that the audio signal to be modulated is pre-amplified using the transistor Q1 and associated components. The transistor Q2 has two jobs: production of carrier frequency and modulation. The pre-amplified audio signal is fed to the base of transistor Q2 for modulation. Capacitor C5 and inductor L1 forms the tank circuit which is responsible for producing the carrier frequency. The video signal is fed to the emitter of transistor Q2 via POT R7 for modulation. The modulated composite signal (audio+video) is transmitted by the antenna A1. 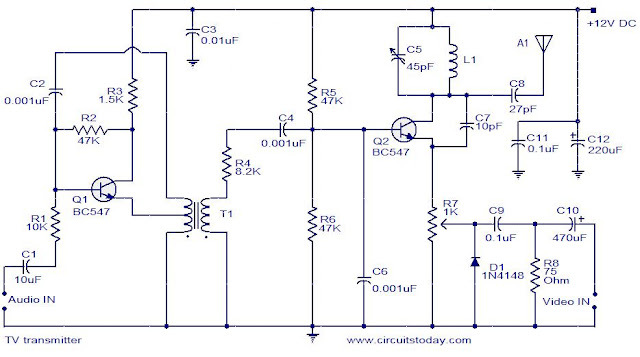 This TV transmitter circuit can be operated from 12V DC. Either a 12V DC power supply or a battery can be used for the purpose, using a battery will surely reduce noise and improve the performance. If you are going with a DC power supply, then it must be well regulated and free of noise.